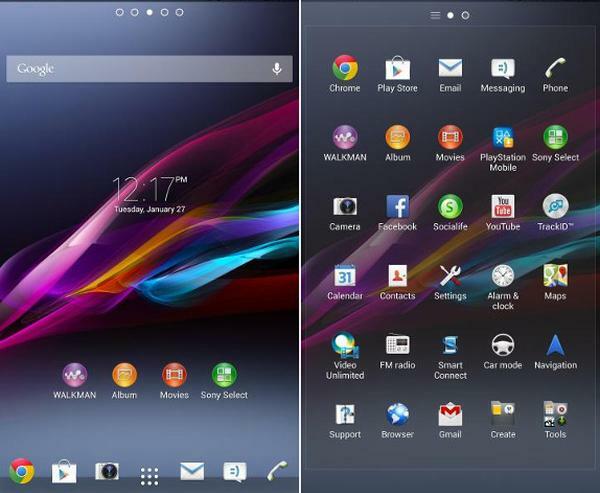 If you are in the market for a phablet smartphone in the next few months it looks like there will be plenty to choose from, and joining the likes of HTC and Samsung the Sony Xperia ZU (Ultra) looks set to provide a worthy alternative that has now seen some screenshots leak with an Android 4.2.2 launcher teaser. Sony looks set to officially announce the device next week on June 25th in Berlin or on the 4th of July in Paris, and the device is thought to feature a 6.4-inch Full HD display powered by the Qualcomm Snapdragon 800 processor clocked at 2.2GHz with 2GB of RAM and an Adreno 330 GPU. Now thanks to the XDA Developers some screen shots that you can see on this page have been leaked that show the device running the Android 4.2.2 operating system. The company certainly looks to be taking advantage of that large display as the app icons are smaller than normal because there is an extra row of them been added. The dock also has six static icons instead of the usual four but it seems that these screenshots may be an early build as the app tray customization such as the ability to sort and search are not present. Other changes include an updated app drawer icon that has a 3 x 3 grid of circles instead of 4 x 4 grid of squares. We don’t have too long to wait before we will know what Sony has in store for the smartphone market though. Are you interested in the Sony Xperia ZU?